They say the joke is that it took years for Chris Stapleton to become an overnight success. His 2016 Grammy Award winning debut album Traveller (2015) picked up the accolades for the Best Country Album while the title track snatched the trophy for Best Country Solo Performance. But those who know this rising star’s talent only wondered what took him so long? Chris has already penned significant songs that have been turned to gold by others – notably The Steel Drivers’ “If It Hadn’t Been For Love”, a track that appeared on Adele’s all-conquering album, 21, also George Straits’ cover of “Love’s Gonna Make It Alright”, the Luke Bryant take on “Drink A Beer” and, perhaps best of all, Tim McGraw’s reading of the magnificent “Whiskey And You”, one of those heartbreak songs you thought no one would write again in the years since Outlaw Country turned from the norm to a wistful nostalgia. Never one to slouch Chris has also penned memorable hits for Kenny Chesney, Josh Turner and Darius Rucker and he doesn’t limit himself to a genre either. We still recall his duet on “Drink You Away” with Justin Timberlake at the 2015 CMA Awards, a momentous career defining episode that took this solo artist into the mainstream and knocked everyone back with his voice, his talent and his guitar. This is a guy bringing back the real country, only with a whole lot of soul. Hailing from Lexington, Kentucky, an area famous for horses and bluegrass Christopher Alvin Stapleton also fulfils that other trope, he comes from a family of coal miners. He is the real deal and his prodigious output – he has well over 400 songs tagged up by the BMI Repertoire folks – can in part be traced to his blue-collar roots. His move to Nashville was however an academic one; he attended the lovely Vanderbilt University and would have become an engineer had he not hankered for home. Resuming studies in Kentucky Chris also enjoyed the communal lifestyle and started playing bluegrass with his new friends, concentrating on modernists like Tim O’Brien and Darrell Scott while keeping a keen ear and eye on the masterly John Hartford and New Grass Revival. Pickin’ and singin’ turned more serious when his song writing skills were spotted and Stapleton was persuaded to revisit Nashville and do the Music Row thing. It worked. A publishing deal arrived and with pen and acoustic in hand our man was up and running. 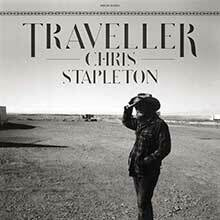 With years of songs old and new to pick from Chris finally released Traveller in May 2015. Working alongside noted producer Dave Cobb he delivered a sound that mixes the old-school with Southern rock – a love from his time in The Jompson Brothers - covering the Charlie Daniels cut “Was It 26” and a song associated with George Jones, “Tennessee Whiskey”, that he also performed with Timberlake, a crack brass band and wife Morgane on BVs. The rest of the album is entirely original and the backing is exemplary. Featured players include Willie Nelson’s ever-present harmonica genius Mickey Raphael, Robby Turner on the pedal steel and rhythm section J.T. Cure and Derek Mixon. Michael Webb’s mellotron and other keys flesh out honest to goodness tracks like “Nobody to Blame”, “Might as Well Get Stoned” and the complex “The Devil Named Music”. If you love raw country then there’s plenty here to discover. The throwback “Outlaw State of Mind” is a firm favourite on stage but other emotional terrain is covered in “Parachute” and the centerpiece song “When the Stars Come Out”. After such a long time as a work in progress it was highly gratifying to see Traveller go Platinum. Sales have zoomed past the million mark and Stapleton’s Vevo appearances are simply go-to sources. As a result Billboard, Entertainment Weekly, Rolling Stone and Stereogum all placed Traveller in their Best of 2015 lists with many noting Chris’s ability to integrate Allman Brothers rock, Texan dancehall and blues. Stapleton’s earthy baritone and his storytelling prowess have also been fingered. His lament to his late father, “Daddy Doesn’t Pray Anymore” seals it for us. Producer Cobb recalls the tension in the studio when Chris stepped up to deliver. To repeat – this is country with a deep soul. Besides, you like the kind of country realism purveyed by Jason Isbell and John Fullbright then this travelling man is one to discover. He has already broken through and now we see him transforming into a major artist. The momentum is with him. Fire away, Mr. Stapleton. We’re listening up. Like many country troubadours, Chris Stapleton cut his teeth as a songwriter in Nashville, churning out tunes that wound up hits in the hands of others. Kenny Chesney brought "Never Wanted Anything More" to number one and Darius Rucker had a hit with "Come Back Song," but those associations suggest Stapleton would toe a mainstream line when he recorded his 2015 debut, Traveller. This new release, however, suggests something rougher and rowdier -- an Eric Church without a metallic fixation or a Sturgill Simpson stripped of arty psychedelic affectations. Something closer to a Jamey Johnson, in other words, but where Johnson often seems weighed down by the mantle of a latter-day outlaw, Stapleton is rather lithe as he slides between all manners of southern styles. Some of this smoothness derives from Stapleton's supple singing. As the rare songwriter-for-hire who also has considerable performance chops, Stapleton is sensitive to the needs of an individual song, something that is evident when he's covering "Tennessee Whiskey" -- a Dean Dillon & Linda Hargrove tune popularized by George Jones and David Allan Coe in the early '80s -- lending the composition a welcome smolder, but the strength of Traveller lies in how he can similarly modulate the execution of his originals. He has a variety of songs here, too, casually switching gears between bluegrass waltz, Southern rockers, crunching blues, soulful slow-burners, and swaggering outlaw anthems -- every one of them belonging to a tradition, but none sounding musty due to Stapleton's casualness. Never once does he belabor his range, nor does he emphasize the sharply sculpted songs. Everything flows naturally, and that ease is so alluring upon the first spin of Traveller that it's not until repeated visits that the depth of the album becomes apparent.